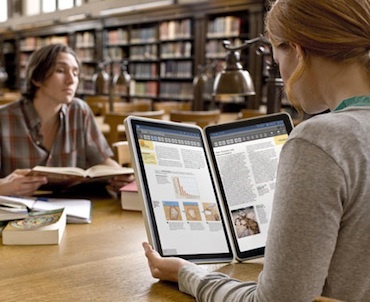 “While no one was looking, someone revolutionized the textbook,” says Kno about its twin-screened tablet PC. Is this just misplaced overconfidence? Deep pocketed VC backers think not. “While no one was looking, someone revolutionized the textbook,” says Kno about its twin-screened tablet PC. Is this just misplaced overconfidence? $46 million in venture capital suggests investors think not. Microsoft’s Courier project got everyone excited about the concept of touchscreen-only tablets when it appeared last year since it seemed like a completely sci-fi-esque slice of the future, with its giant, folding twin-screen design and intuitive interface. Then Toshiba went far beyond Courier’s concept project stage and actually took its twin-touchscreen tablet the Libretto W100 to market, albeit in limited numbers and powered by Windows. It’s having excellent reviews, despite its high price ($1,100) and relatively small screens at 7-inches each, which, combined, gives the unfolded device about the same screen real estate as an iPad. Essentially Kno marries a Tegra 2 CPU and 16GB of on-board storage with twin 14.1-inch capacitive touchscreens that use the same high-quality IPS LCD technology as found in the iPad. It’s powerful enough to act as a full-color interactive textbook e-reader (including on-page note taking via stylus inputs, sticky notes and so on) and also as a Web browser, plus HTML5 and Flash capabilities. It brings to life the interesting notion of browsing a text book on one screen while simultaneously looking up background references on the Web on the other–or taking notes; it has handwriting recognition so your lecture notes get automatically neatened. It’s also being touted as a powerful media-playing machine–with HD video playback and audio recording powers. From the opposite end of the ecosystem, Kno also plans to offer textbooks for the device through its own dedicated e-bookstore–with an emphasis on webkit compatibility so that the content can also be accessed on other devices. Sounds too good to be true, doesn’t it? The promise of lightening student’s book-carrying burdens while simultaneously enabling all sorts of advanced e-teaching all seem excellent plans, which one may think will attract a huge unit price for the Kno. But maybe that’s what the injection of $46 million in venture capital from investors led by Andreessen Horowitz (Netscape founder Marc Andreessen’s firm) will help with–if spent properly, it could result in a production design that’s economic and powerful at the same time. The goal is get a sale price of under $1,000 and Kno has ambitious plans to get a working model tested, optimized, produced and on sale by the end of 2010. Color us intrigued–as we’re sure many students will be–because as well as an interactive textbook, this machine sounds like the ideal tool for a mobile blogger.